tv schedule Italy; It looks like there will be live video of Monday's stage 1 at 15:45 20.25 CEST (30 min). Check back for an unrestricted link. See the guide for delayed video of all other stages. photostream official live text updates. As usual, like other Italian races, the organizers posted virtually nothing "live" for stage 1 so don't get your hopes up for the remaining stages. April 19 update: Many great climbers have won the Giro del Trentino but it's probably the most unheralded stage race in cycling. It takes place in the spectacular Dolomites, in or near the Province of Trento (Trentino), where many of Italy's best cyclists live. It's one of the last races before the Giro d'Italia, but it also brings out some very good pro continental and domestic climbers whose teams weren't selected for the main event (The Giro). The overlap with the Ardennes classics, the lack of live video or even decent text updates and the remoteness of this race are several key reasons why this race doesn't draw more attention. In many ways, this race is the Italian counterpart to the Critérium du Dauphiné Libéré in France. April 13 update: See the links in the race summary table. 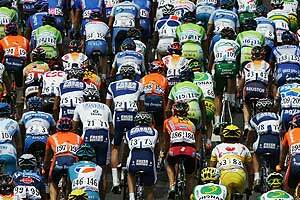 January 31 update: The 2010 Giro del Trentino is April 20 - 23, 2010. Astana led by Alexander Vinokourov have confirmed their participation. Vinokourov is expected to use it for his Giro d'Italia final prep. Ivan Basso has also confirmed he will defend his overal win from last year for Liguigas-Doimo. The new BMC Racing team plans to bring the former world champ, Alessandro Ballan, and current world champion, Cadel Evans. (english) official live text updates. 2 Ivan Basso (Liquigas)                        + 0'04"
3 Przemyslaw Niemiec (Miche-Silver)            + 0'19"
1 Przemyslaw Niemiec (Miche-Silver) 137 km in 3h50'44"
2 Ivan Basso (Liquigas)                        + 0'22"
3 Giampaolo Caruso (Flaminia)                  + 0'45"
4 Gilberto Simoni (Diquigiovanni-Androni)      + 0'45"
5 Jani Brajkovic (Astana)                      + 1'01"
3 Przemyslaw Niemiec (Miche-Silver)            + 0'22"
2 Jani Brajkovic (Astana)         0'01"
3 Andrey Grivko (Milram)          0'07"
April 20 update: A four day stage race, the Giro del Trentino serves as a training race for the Giro d’Italia, and in particular for the mountain stages of Italy’s grand tour. Mountains dominate the region of Trentino, situated in Northeastern Italy and bordering Austria. This is the home region of Francesco Moser and Gilberto Simoni, and it’s easy to see why it would breed climbers. 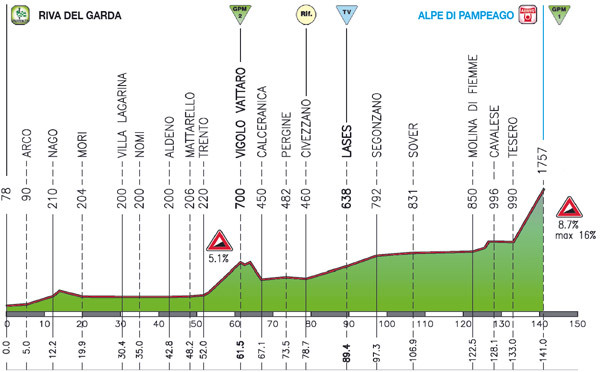 As the stage profiles for this Giro del Trentino show, flat roads are few and far between. "The Giro del Trentino will be harder than ever. Too bad, that Armstrong will not be there, but Basso and Simoni will give a nice antipasto for the Giro d'Italia," commented Francesco Moser recently. This year’s race welcomes four previous Giro d’Italia winners: Ivan Basso of Team Liquigas, Danilo Diluca of LPR Brakes, Stefano Garzelli of Acqua e Sapone, and local boy, Gilberto Simoni of Diquigiovanni-Androni. Team Liquigas will also bring Giro co-captain Franco Pellizotti to the party in Trentino. Pellizotti finished fourth in last year’s Giro d’Italia. Other riders to watch include Andreas Klöden who will lead Astana, climbers Félix Cardenas and Juan Mauricio Soler representing Barloworld, last year’s Giro third place Marzio Bruseghin of Lampre-Ngc, former Italian National Champion Giovanni Visconti of ISD, and climber Ezequiel Mosquera of Xacobeo-Galicia who finished fourth in last year’s Vuelta a España. Alessandro Petacchi will start for LPR Brakes, though he will not enjoy much, if any podium time on this mountainous course. Last year’s winner Vincenzo Nibali of Team Liquigas will not ride Trentino, as he is busy in the Ardennes this week. Likewise, for former winner Damiano Cunego of Lampre-Ngc. The race will have a special prime for the "most combative" rider to commemorate Enzo Moser, the older brother of Francesco Moser. Enzo Moser, who wore the Maglia Rosa for two days in the 1964 Giro, was killed in an accident last July. The journalists covering the race will determine the winner of this prize by vote. There will also be a special prime for the winner of stage 2 to commemorate the tenth anniversary of Marco Pantani's win on the Alpe di Pampeago during the 1999 Giro d’Italia. Stage 1. 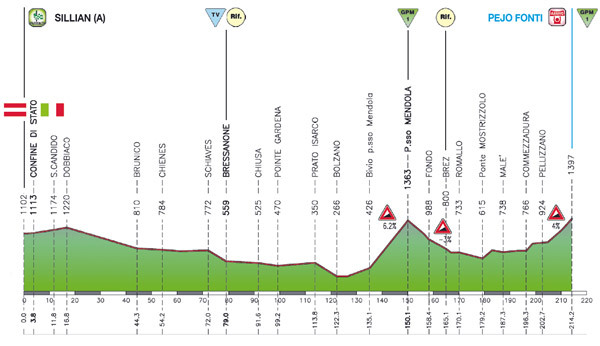 The Giro del Trentino opens with a 17.5 kilometer time trial whose profile is almost completely flat. 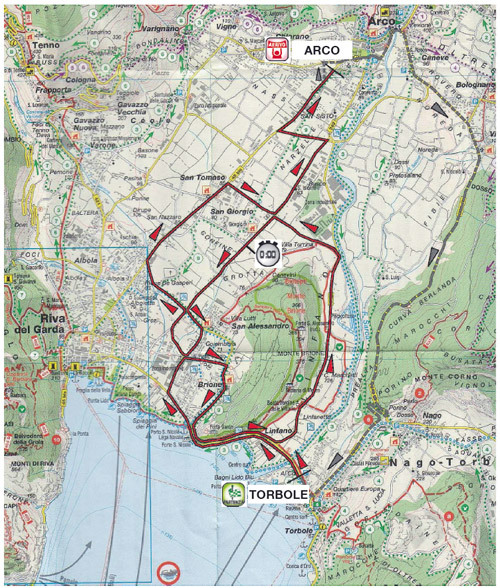 The course begins in the town of Torbole on the banks of the Lago di Garda. After a series of loopy bits, the course travels northeast to finish in Arco, one of the many valley towns set among the mountains in Trentino. The crono is curvaceous and technical, boasting 52 corners. 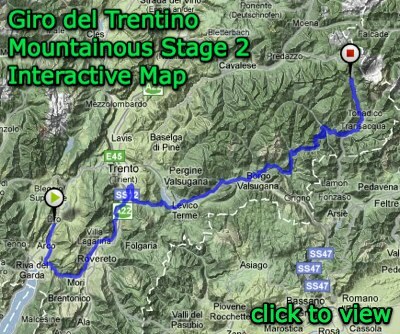 This stage is one for the crono specialists, but the short distance won't hurt the climbers too much. Gilberto Simoni will still be smiling when it's over, but Basso will be smiling even more. Marzio Bruseghin should ride well here, as should Andreas Klöden. Stage 2. 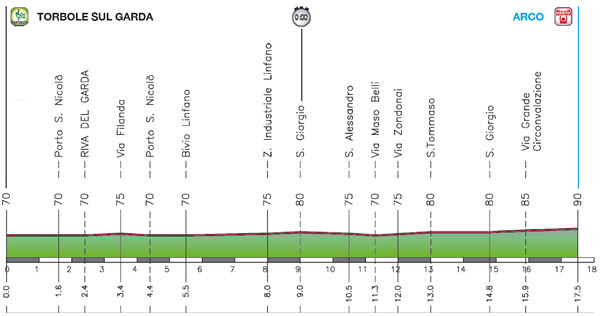 The second stage begins in Riva del Garda near where the crono began. 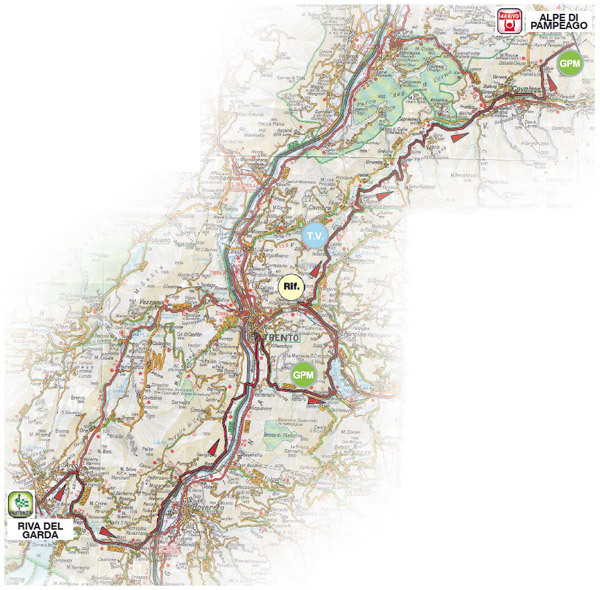 The course follows the valley floor Northeast approximately 50 kilometers until it reaches Trento. The flat kilometers are a tease, though, for this stage is made for the climbers. 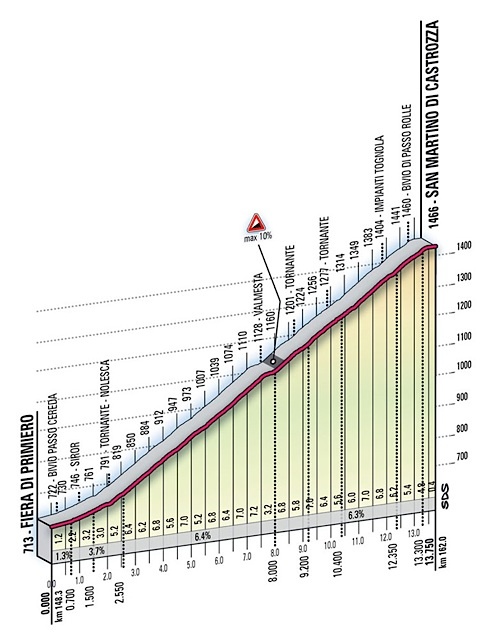 Just outside Trento comes the first climb of the day, the Vigolo Vattaro. The Vigolo Vattaro lies in the mountains surrounding Trento and climbs for 10.42 kilometers at an average gradient of 5% (maximum, 7.8%). Just a sign of what is to come, this climb serves to whet the appetite. After a brief descent, it's all climbing to the finish of this stage. Gilberto Simoni will certainly be smiling today, as the race travels his home roads and into his favorite terrain. The road traces a long, gradual climb through the forested lower slopes of Trentino's mountains, before finishing on the Alpe di Pampeago, a short, steep bit of uphill nastiness. The Pampeago is deceptively brief, just 9 kilometers, but it boasts an average gradient of 8.7%, and a maximum gradient of 16%. Only the pure climbers will enjoy this one. The stage commemorates the 1999 victory of Marco Pantani in Stage 19 of the Giro d'Italia. Two days later, the UCI ejected Pantani from the race after a blood test showed a hematocrit above 50 percent. Ivan Gotti went on to win that year's Giro. Gilberto Simoni finished second on the Pampeago in 1999, just over a minute behind Pantani. Four years later, Gilberto Simoni got his chance to celebrate victory in front of his local fans when the Giro d'Italia visited the Pampeago again in 2003. The climber from nearby Palu di Giove beat Stefano Garzelli by 35 seconds. They will meet again on the Pampeago in this year's Giro del Trentino. Stage 3. The route slip calls for more climbing during the third stage, which begins in Tesero and travels to Innervillgraten in the East Tirol region of Austria. In between lies the Gruppo del Sella, the group of peaks in the Dolomiti which includes the Passo Sella and the Passo Pordoi. 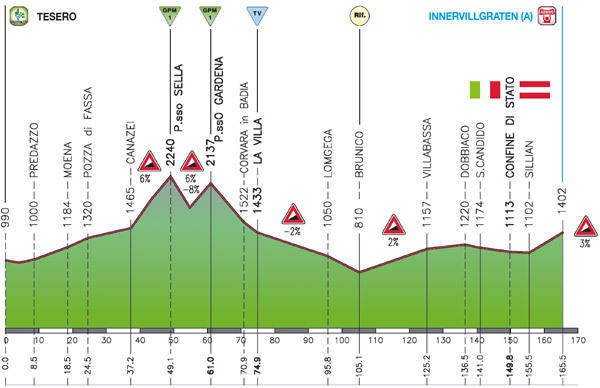 The riders will climb two peaks in the Gruppo del Sella, the Passo Sella and the Passo Gardena. 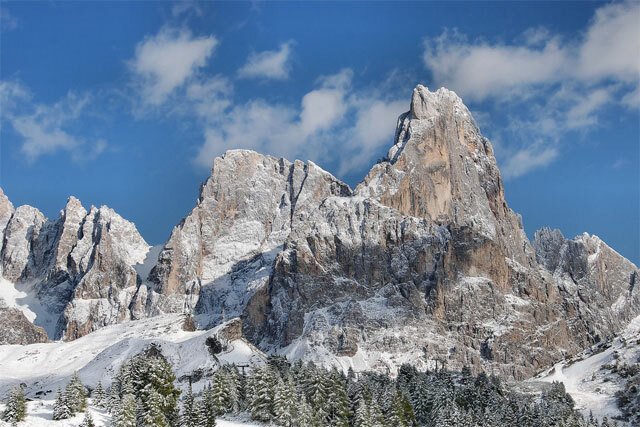 The Passo Sella covers 11.5 kilometers, climbs 758 meters, and has an average gradient of 6.6%. The maximum is approximately 8 percent, about half as steep as the Pampeago. From the summit of the Passo Sella, the riders descent 5 kilometers before facing the next climb of the day, the Passo Gardena. Fortunately, the Gardena is short with a relatively gentle gradient, only 6 kilometers averaging 6 percent. After descending the Passo Gardena, the course follows a series of Alpine valleys, passing through Brunico. There is 25 kilometers of downhill false flat after climbing the Sella and the Gardena. With 60 kilometers to go, the course turns ever so slightly uphill, and the riders will grind up a 2 percent gradient until they reach the town of Silien. The last 15 kilometers climb with an average gradient of 3 percent into Innervillgraten, a picture-book Tyrol town tucked between the steep slopes of the Alps. The finish is uphill. The climbs come early in this stage, offering the chance for many riders to return to the field before the finish. Perhaps a break will survive to celebrate victory in Austria, but it's more likely that a sizeable group will contest the finish. Stage 4. 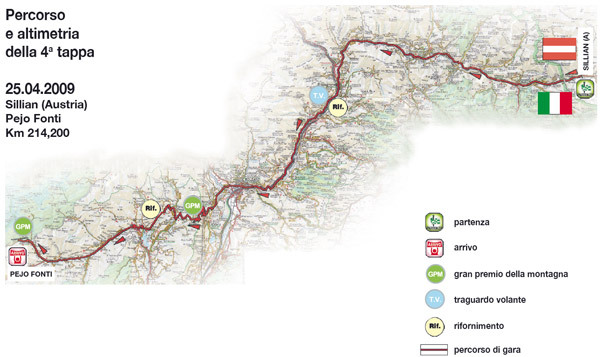 For stage 4, the race departs from Sillian in the East Tyrol and re-traces its steps back into Italy to finish at Pejo Fonti. For the first 125 kilometers, the terrain is mostly flat, and the course steadily descends in altitude. Then, it's back into the mountains. 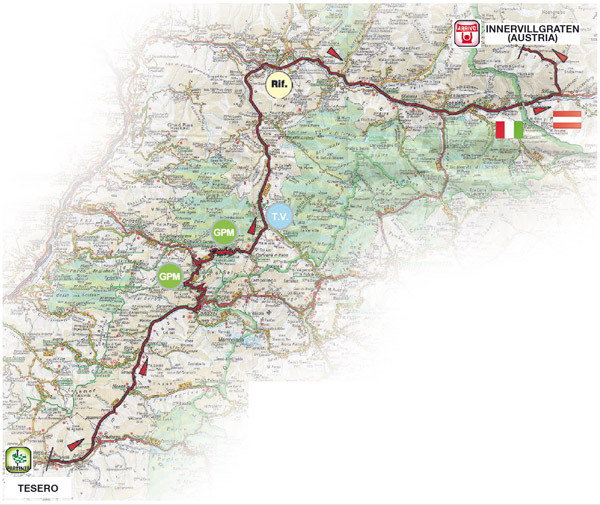 The main climb of the day is the Passo Mendola, which climbs 14.8 kilometers and has an average gradient of 6.5%. Cut into the side of the mountain, which rises at a near-verticle pitch from the valley floor, the road serpentines to the summit. After 14.8 kilometers of climbing, the riders pass through the ski town at the summit of the Passo Mendola, and begin their descent. There follows 30 kilometers of descending at approximately 3%. But again, the road turns upward, beginning a gradual climb to the finish in the tree-lined Alpine town of Pejo Fonti. Fittingly, the stage ends on a 10 kilometer climb, though it isn’t steep at only 4%. Still, allow me to state the obvious: A climber will win in Pejo Fonti. From the 1999 Giro d'Italia, video of the finishing climb up Alpe di Pampeago where Pantani and Simoni finished first and second. January 13 update: Giro del Trentino is a mountainous stage race warm-up for the Giro d'Italia that takes place just south of the main Dolomites in Northern Italy in the Trentino (Trento) province. It's home to many past and present Italian greats so the event brings out many big names and ProTour squads but it's not a 2.HC event, the top classification for a UCI stage race. The 2009 dates are April 22-25th 2009. If anyone has pre-announcement information on the actual route then let me know. I do know there will be a stage finish in Innervillgraten in the ancient Tyrol region of Austria.